Monaghan forward Conor McManus believes the Farney men will face a fiercely committed Cavan side in Sunday's opening Ulster Football quarter-final. 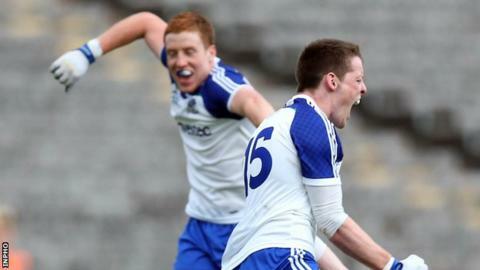 Malachy O'Rourke's Monaghan beat then All-Ireland champions Donegal in the 2013 Ulster final after edging out Cavan by a point in the semi-final. "That game could easily have been won by Cavan," said the former All-Star. "They will probably be looking at this game as their big chance. We are under no illusions about Sunday's task." On the face of it, Monaghan look in a better place after an impressive run to the Division 1 football league semi-finals which included a deserved win over Donegal in Ballybofey. Cavan did preserve their Division 2 status but McManus believes this was no mean feat given the standard in the second division. "They were within touching distance of making it up to Division 1 themselves. We know how difficult it is to get out of Division 2. "They will be coming into this game in good stead too." McManus also believes that Cavan's home advantage will make Monaghan's task all the more difficult although the Farney county's recent comparative struggles at Breffni Park have been in league and McKenna Cup games. "The local rivalry is always there between the two counties. And the fact that game is in Breffni Park will make the challenge even harder for us." As Monaghan's marquee forward, McManus can expect to be tightly marked on Sunday as the Cavan defence attempt to shackle the former All-Star in a similar fashion to Justin McMahon's marking job on Michael Murphy last weekend. McManus is realistic about that prospect but the plus side from 12 months ago, is that McManus has has avoided any major injuries so far in 2015 and should go into Sunday's game in peak fitness. The Clontibret man sustained a troublesome ankle injury in early May last year and while he was able to line out in all of Monaghan's championship games, his ailment needed careful management. "When you are injured, your sole focus is just trying to rehab it and get it right and maybe you don't get as much time to think and prepare for matches as you would like. "So it's nice to have a relaxed run-in this year."